One of the best known small cars in the UK market is the British-built Nissan Micra hatchback. 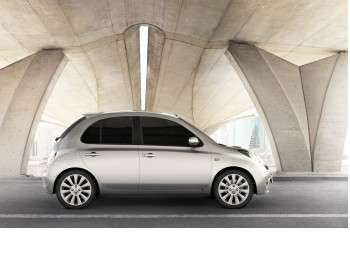 For 2008, it is undergoing a revamp with changes to the styling, additions to the equipment list and a new model naming structure – adding even further to Micra’s appeal, ahead of its late-2008 Australian release. The first visual change to styling for the current Micra can be seen on the front grille which moves away from the chrome centre line over to a chrome surround, providing a cleaner and fresher look. This continues with the front headlamps that now have a less profound profile to the parking aid making it smoother and incorporating a light blue tint. Additional changes have been made to the B Pillar trim which is no longer colour coded giving an improved side profile. The wheel cover designs have, also, been restyled. A new colour known as faded denim taken from the Qashqai palette has now been included as an option, replacing Thunder Quartz. The Qashqia will be released later this year in Australia as the Dualis. The interior trim receives a more conservative colour treatment with black now available on most trim grades. However, for a much lighter and vibrant environment there is a choice of beige trim on some trim levels, incorporating a tastefully coloured chocolate flash across the dash panel and door trims. The seats are now sports sculptured for the high trim level model. An MP3 jack socket is included on all Micras so you can easily play your personal collection of music through the vehicle’s own stereo system, which incidentally has also been improved with a double DIN audio unit for higher trim levels. The engine line-up for the UK range remains unchanged with 1.2, 1.4 and 1.6 petrol and a 1.5dCi diesel being available. The Australian model line-up and specifications will be announced in due course.